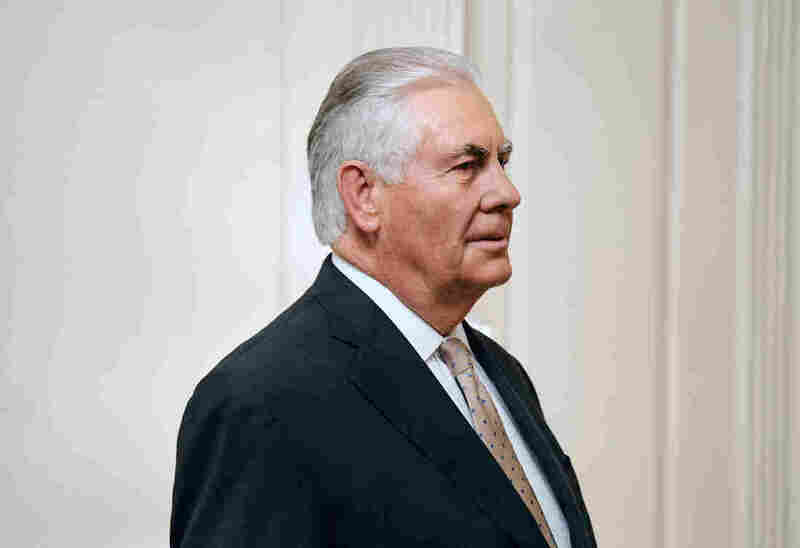 Transcript: Secretary Of State Rex Tillerson Talks To NPR's Steve Inskeep In his first interview with NPR, Secretary of State Rex Tillerson has a wide-ranging interview with Morning Edition's Steve Inskeep. Secretary of State Rex Tillerson in the George C. Marshall room at the State Department on Thursday. In his first interview with NPR, Secretary of State Rex Tillerson has a wide-ranging interview with Morning Edition's Steve Inskeep. Steve Inskeep: I want to begin with North Korea. We heard when you said, "the era of strategic patience is over," so we know what your policy is not. Is there a word or phrase you can give us to say what your approach to North Korea is? Secretary of State Rex Tillerson: Yes, our approach to North Korea is to have them change their posture towards any future talks. And I think when we say the era of strategic patience is over — in the past I think we have always negotiated our way to the negotiating table. Now when they act up, we would negotiate our way to get them to come to the table, and then decide what we're going to give them to have them behave. We don't have the running room left to do that now, given how far advanced their program has become. So this is an approach that is to put pressure on them through implementation of all the sanctions, as well as other diplomatic pressures, and calling on others to cause them to change their view of what will really allow them to achieve the security that they say they seek. Do you intend to direct talks with North Korea? Is that your goal? Obviously, that would be the way we would like to solve this. But North Korea has to decide they're ready to talk to us about the right agenda — and the right agenda is not simply stopping where they are for a few more months or a few more years and then resuming things. That's been the agenda for the last 20 years. Well help me understand what success is from your point of view. What does the goal have to be? Well our goal is the same as that of China, which is a denuclearized Korean peninsula. No nuclear weapons for North Korea? A denuclearized Korean Peninsula. It's very clear: That's China's stated policy, it has been our stated policy, it's been the stated policy of our allies in the region. And I would quickly add, you know, we did our part — we took our nuclear weapons out of the Korean Peninsula. It's time for North Korea to take their weapons out as well. It is our goal. It is our only goal. And would you go so far as to say that is an absolute goal? I'm thinking of the way that President Obama during the nuclear negotiations with Iran said Iran will not have a nuclear weapon, period. Are you prepared to say: North Korea will not end this process with nuclear weapons, period? We must have a denuclearized Korean Peninsula. That is our goal, pure and simple. I guess I'm asking if that's a red line for you — North Korea keeping any nuclear weapons at all. We don't have any red lines. I think what you're talking about perhaps is — how do we get there? And we say: We can't begin the process of getting there until North Korea comes to the table with a willingness to talk about how we get there — and how they achieve their objective. You know, if you listen to the North Koreans and the regime of Pyongyang, their reason for having nuclear weapons is, they believe it is their only pathway to secure the ongoing existence of their regime. What we hope to convince them is: You do not need these weapons to secure the existence of your regime. Meaning you could assure the existence, or the continued existence of the regime? We have been very clear as to what our objectives are. And equally clear what our objectives are not. And we do not seek regime change, we do not seek a collapse of the regime, we do not seek an accelerated reunification of the peninsula. We seek a denuclearized Korean Peninsula — and again that is entirely consistent with the objectives of others in the region as well. Mr. Secretary, people will know that you're trying to work through China on this and make sure that China is applying the appropriate pressure — one of many things you're trying to deal with China on. I'd like to ask about the relationship between the president and the president of China, Xi Jinping. How important is that personal relationship between the two leaders? Well it's extraordinarily important, first to just the broader relationship of where U.S.-China relations are going to find themselves over the next two to three to four decades. I think we are at a bit of an inflection point in the U.S.-China relationship. Now, North Korea is a threat that presents itself right up front to both of us, and in our conversations with the Chinese — and we have been very clear to them. I was on my initial trips to Beijing, and then in the visit of President Xi to Mar-a- Lago, the president and I were able to be very clear to them that things have to change in North Korea. And we need their help doing that. Now, we like for them to help, we want them to help. If they believe for their own reasons they cannot help, then if they'll just let us know, we'll take that into consideration as we go forward. I think to this point, what China is beginning to re-evaluate is whether North Korea is any kind of an asset to them, or whether North Korea themselves and the regime have become a liability to China's own security. Because as I've said to my Chinese counterparts, those missiles go in all directions. And whether this regime is one that they feel is reliable for them to continue to work with. When you say two or three or four decades, suddenly many things beyond North Korea are on the table. China wants to dominate its region. It wants to dominate the South China Sea, has a different view of the world than the United States. How do you persuade China to see its interests differently, and in a less threatening manner to the United States long-term? Well I think we need to understand one another much better, and understand that China is on a pathway of continuing to emerge with their own people, in terms of providing a quality of life to their own population. You know, they've made enormous progress over the last 10 to 15 years — 500 million Chinese have moved out of poverty into middle-class status — but there's still a large country with a lot of people that are still living in poverty. So they are still on this pathway to prosperity. Our understanding of them — and I think they need to have an understanding of us — is that we do not seek to constrain their need to continue their economic growth and to continue to help their people enjoy a better quality of life. As they are pursuing that, though, they have to do that in a way that supports stability around the rest of the world as well. Does that mean they need to constrain their ambitions or that you need to constrain them? Their strategic ambitions — their ambitions to power? Well, it depends on how they view those strategic ambitions and whether those present a threat to stability for the rest of the world or not. And I think, you know, a specific example obviously is their activity towards island-building in the South China Sea, and in particular their militarization of those islands. We have had very, very frank conversations and exchanges with the Chinese around these activities, and our view that this destabilizes the areas of the South China Sea rather than create stability. And it represents a threat to others in the region that are going to be important to China's economic prosperity as well. So we're hopeful that we can find common ground to work together with them to deescalate this particular activity of theirs and find some point of stability working with them. We're on the very front end of our relationship with the Xi government and we have put in place some mechanisms to begin this exchange of understanding each other better and seeing if we cannot chart a pathway forward that accommodates the interest of China but also accommodates the interest of the American people — our own national security — but stability for the region and the world as well. Mr. Secretary, I want to ask you about your new job. Some people will know that your old company had a mission statement that Exxon wanted to be the premier petroleum company in the world. What's your mission statement for the State Department, if any? I think our mission here is to deliver on the president's policies to secure — to provide the national security needs of the American people, and to advance America's economic interest around the world. And I think the issue for us is how well we deliver on that mission through all of the various aspects of what State Department involves, from diplomacy, to our assistance programs, to helping nations that are just emerging, to dealing with conflicts, and our role of de-conflicting areas and solving conflicts. So it's all about how we deliver on that mission. Do you see a department that wasn't delivering in some key areas? Our administration, the Trump administration, has a different approach to how the administration wants to utilize the State Department in delivery of the mission. And I think that is developing. We're in the early days, again, in terms of how the National Security Council itself functions and how the president wants to use this State Department. And I'm confident the men and women of the State Department, whom I've been very impressed with since I arrived, are going to deliver on that mission. All we have to help them understand is — what do we want them to do. And I'm confident they're going to deliver on it. Although, when you talk about a 31 percent budget cut, it suggests you think some of the functions of this department are not necessary, or are not paying off. Well, I think if they if one looks at the State Department over the last, say, decade, if you look at a chart from 10 years ago and you look at a chart today, there's a lot of added boxes on that chart. Now, and this is not as simple as just putting x's through boxes. We are undertaking a reorganization of the State Department, but it's not just a collapse of boxes. What we really want to do is examine the process by which the men and women — the career foreign service people, the civil servants, our embassies — how they deliver on that mission. And we want to hear from them — we're just about to embark on a department-wide listening mission. I know, because I've had a few interactions with people over lunch, some of our folks that are kind of at the 10- to 12-year stage of their career — where they're young and energetic but they've been around long enough to see what works and what doesn't — I look forward to hearing their ideas. Because I know there's going to be opportunities to allow them to be more effective. Now, out of that we'll determine what the State Department looks like. There is no predisposed outcome, though. You have a unique opportunity — because you come from outside the world of diplomacy, because you have an outsider's eyes and you've had an opportunity in the last couple of months to look around and just ask, why? Why are things this way? What are some specific "why" questions you've posed to your people? But I would tell you that, you know, there are a lot of rules — and people follow the rules, and you look at the rule, and you say, well, as you said, "why do we do it that way?" And no one can seem to remember why we did it that way. Now, I'm sure the rule was put in place once upon a time to address a specific situation, and then because of the way our government changes every four, eight years, a lot of these rules get left in place and no one ever goes back to reexamine them. So we encounter a lot of those, and people are frustrated by that. I hear from them, you know, that they're frustrated — and then we say, well then let's get rid of that rule. Well that would be rather chaotic to just do it that way so that's part of this whole exercise that we're about to go through is, let's try to expose and examine places where we're really getting in our own way with things that have been put in place in the past. Is there a policy — not just an internal rule, but a policy — that's made you say why are we approaching Pakistan that way? Why do we treat sub-Saharan Africa that way? Well, I would say what I have encountered more often than not is the absence of a policy, the absence of a well-articulated policy. And so it's not that people weren't doing things that were worthwhile, but they were doing things without a clear direction as to what was the end state we were trying to achieve? So one of the things we are doing early on — and we have to take this kind of country-by-country, region-by-region — is to look at our presence there and what is the end state, what are we trying to achieve on behalf of the American people? What's in our national security interest? What's in our economic interest? Do we know what that looks like? "In a perfect world, this is where we would want this to be." Then it allows people to drive their mission towards that end state. And what I found more often than not is, there's not a clearly articulated policy around a particular region. Clearly we want to go help people. We want to de-conflict. Do we understand why, and what we're trying to achieve in the longer run? What's the end state with Russia? The ideal end state, of course. I think we would like to have a relationship with Russia where they do not threaten, or they don't pose a threat, to the United States or to any of the Western part of the world; that Russia wants to be a positive member of the global world order. They will have, always have, their own interests that they have to represent. But they want to be a positive part of the global world order, not a disruptive part and not a threat to others. I'm thinking about the fact that we're talking on a day when the United Nations Ambassador, Nikki Haley, has made more statements criticizing Russia for its involvement in human rights abuses, effectively, in Syria and it makes me wonder if the odds of an improved relationship with Russia have gone down since the administration has taken office. I don't think the odds have changed one way or the other. I think the situation is — as I assessed it, and this is what I, in fact, said in my trip to Moscow, my meetings with foreign minister Lavrov and with President Putin — is, my assessment is the U.S.- Russia relationship is at an all-time low, the lowest point it has been since the end of the Cold War. And I would tell you that their response was they didn't disagree with that. I said we have a very low — almost no level of trust between us. And that my statement on that was: This cannot be the relationship to exist between the two most powerful nuclear nations on the planet. We cannot have this kind of relationship. And it's in a downward spiral — we've got to stabilize it and we've got to begin to understand how we're going to turn this around. Now we talked about a broad range of areas that we're going to have to address. We didn't solve anything in that meeting — I didn't expect we would — but we had a very open, frank exchange on where we stand today, and do we want to address that or not? And we will be having further meetings in the future about it. Do your personal relationships in Russia help at all? Or is this really just a national calculation of interest, and they see their interest differently than the United States will see its interests? Well I think Russia is going to act in Russia's best interest. This is what all nations do. I think to the extent that I have longstanding relationships with the leadership in Russia, to the extent that's helpful in that they already know me — they don't have to try to figure out who this guy Rex Tillerson is because they've dealt with me for so many years — perhaps that's helpful. In that my ability to communicate is very straightforward, very candid, it's not nuanced, because I have found in dealing with the Russian leadership in the past — that is what they respect. Two other things, Mr. Secretary. You've indicated that this department needs direction, but you're undertaking a review of the department's purpose and you're leaving a lot of senior jobs unfilled, perhaps for quite a long time. Is this department, are your diplomats around the world, going to get proper direction if they don't have a senior leadership other than you? Well the leadership team's coming. It's been a little slower than even I would have hoped, but these people are, they are moving through the system and we will begin to fill many of these positions. I think what's important for everyone to understand though is, while those positions have been open, we have terrific career foreign service officers and civil servants who have stepped up. And I can't tell you how pleased I've been with how they have conducted themselves in these acting roles. And this is tough for people to do when they know they may or may not remain in these positions longer-term. But these are career professionals — they're looking for direction, they want to help us achieve the mission. And with the very rarest of exceptions, the folks at the State Department have performed remarkably well for me and the team I do have here in helping us develop and advance the president's foreign policies. Do foreign diplomats take them seriously, or think they're dealing with the B-team? No, they take all of our representatives seriously. Most of these folks have longstanding relationships in place in these countries. They're well-known. And when they know that they're speaking for this administration, they're taken seriously. We are sitting in the George C. Marshall room. And in fact, George C. Marshall is looking down at us from his portrait here. Pretty intense gaze. Marshall, of course, was known for the Marshall Plan and for the phrase "enlightened self-interest" — helping other nations in order to help the United States. Some people would presume that President Trump has a very, very different approach to foreign policy and to U.S. interests in the world. Is it different? And if so, how? I think perhaps it's just articulated a bit differently. When the president says he wants to put America first, I think that is the correct position to take — because I think too often we have compromised America's interests thinking that we were going to enhance it in the approach we take with others. I think what the president has said — I'm willing to look at a broad range of options, but I want to know at the end of it that the American people have won, and that we have come out with a stronger national security for the American people, and we've come out with a stronger economic posture and a better future for prosperity. And that doesn't mean that that comes at the expense of other nations — it means as we're developing those policies and we're developing how we want to interact with other nations, we never lose sight of where we have to end up at the end of it. Because if we're not strong, we cannot promote all the values of this nation that represent the very best of this world to others. But with that said, does that mean that if there were a need for another Marshall Plan, to spend billions of American dollars somewhere, the president would be open to that? If it is going to solve serious national security threats to the U.S., if it's going to put us on a stronger economic future and prosperity because of stability — we don't prosper well in an unstable world — then the president's going to be open, I think, to any plan. And I know a lot of people look at certain parts of the world that are in a lot of trouble today as to, how are we ever going to rebuild these? Well, we don't have to do it by ourselves. And I think that's the president's message as well is: We will lead — we will be the first out there to lead — but this is in the interest of so many other countries as well, and we expect you, and we're going to hold you accountable, to stepping in and doing your part in stabilizing these regions as well. And so I think that's what's reflected, whether it's in the president's call for everyone to step up and do their part for NATO, or whether it's in the president's call for everyone to step up and do their part in stabilizing the Middle East, Syria, Iraq, and other regions. He is saying: We will be there, we will provide the leadership, we will put our shoulder to it — but we're not going to do this alone. Everyone has to come with us.